The Berkeley CSL  club is hosting a “Barcraft” at Pappy’s. What is a “Barcraft” you ask? Well it combines two very manly activities, going to a bar and Starcraft. On the big screens of Pappy’s Bar and Grill on Telegraph, you can watch some of the best professional Starcraft players in the world play in the finals of the IPL 4 tournament. It is a great learning opportunity for those new to the “craft,” and a great space to meet new Bresties (Bro/besties), or just enjoy the game while sipping on an ice-cold brew. This is not the first Barcraft, nor will it be the last. They usually take place about every two weeks and you can stay updated by visiting the Berkeley Collegiate Star League  website. They are always free and open to all ages. 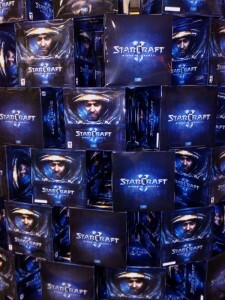 This particular Barcraft will be sponsored by a number of eSport  organizations. Because of this raffle prizes will be given out. (all participants get a free raffle ticket, and a second raffle ticket if they buy 5 dollars worth of food or drink). The event lasts all day from 11:00 a.m to 9:00 p.m, so you can stop by anytime. As CSL at Berkeley club member Dylan Rogers told us, “It is like going to watch football at a Sports Bar … The same concept, the same feeling.” This is just one more unique way to spend your evenings in Berkeley, a city where we are encouraged to embrace our inner nerd. Come on, everyone has that little voice inside them that quotes Gandalf during finals, knows all there is to know about Harry Potter  and wishes they had the balls to sport a “I would rather be playing video games” license plate frame. So shut up all you haters – if we can watch it at a bar amidst other screaming fans than it is a sport!